Like passionate foodies who know the best places to eat in every town, Silk Road nomads may have been the gastronomic elites of the Medieval Ages, enjoying diets much more diverse than their sedentary urban counterparts, suggests a new collaborative study from Washington University in St. Louis, the Institute of Archaeology in Samarkand, Uzbekistan and Kiel University in Germany. "Historians have long thought that urban centers along the Silk Road were cosmopolitan melting pots where culinary and cultural influences from far off places came together, but our research shows that nomadic communities were probably the real the movers and shakers of food culture," said Taylor Hermes of Kiel University, lead author of the study forthcoming in Scientific Reports and a 2007 graduate of Washington University. Based on an isotopic analysis of human bones exhumed from ancient cemeteries across Central Asia, the study suggests that nomadic groups drew sustenance from a diverse smorgasbord of foods, whereas urban communities seemed stuck with a much more limited and perhaps monotonous menu—a diet often heavy in locally produced cereal grains. "The 'Silk Road' has been generally understood in terms of valuable commodities that moved great distances, but the people themselves were often left out," Hermes said. "Food patterns are an excellent way to learn about the links between culture and environment, uncovering important human experiences in this great system of connectivity." Said Cheryl Makarewicz, an archaeology professor at Kiel and Hermes' mentor: "Pastoralists are stereotypically understood as clinging to a limited diet comprised of nothing but the meat and milk of their livestock. But, this study clearly demonstrates that Silk Road pastoralists, unlike their more urbane counterparts, accessed all kinds of wild and domesticated foodstuffs that made for a unexpectedly diverse diet." "This study provides a unique glimpse into the important ways that nomads cross cut regional settings and likely spread new foods and even cuisine along the Silk Roads, more than a thousand years ago," said study co-author Michael Frachetti, associate professor of anthropology at Washington University. "More specifically, this study illustrates the nuanced condition of localism and globalism that defined urban centers of the time, while highlighting the capacity of more mobile communities—such as nomadic herders—to be the essential fiber that fueled social networks and vectors of cultural changes," Frachetti said. For this study, human bones exhumed at archaeological digs in Uzbekistan and Kazakhstan were transported to Kiel University in Germany, where they were analyzed by Hermes. To be thorough, he also collected previously published isotopic data for the time period to bring together a complete regional picture. "Prior to this study, there were massive gaps in what we knew about human dietary diversity along the Silk Roads," Hermes said. "The datasets were simply not there. We were able to greatly increase the geographical coverage, especially by adding samples from Uzbekistan, where many of the important routes and population centers were located." The study draws upon field work and museum collections as part of a longstanding scientific partnership between Washington University and the Institute of Archaeology in Samarkand, Uzbekistan. The study's assessment of individual dietary regimens is made possible by studying the isotopic signatures in ancient human bones, allowing the researchers to unlock a trove of information about the food sources, including the proportions and types of plants and animals consumed by individuals over the last decades of life. 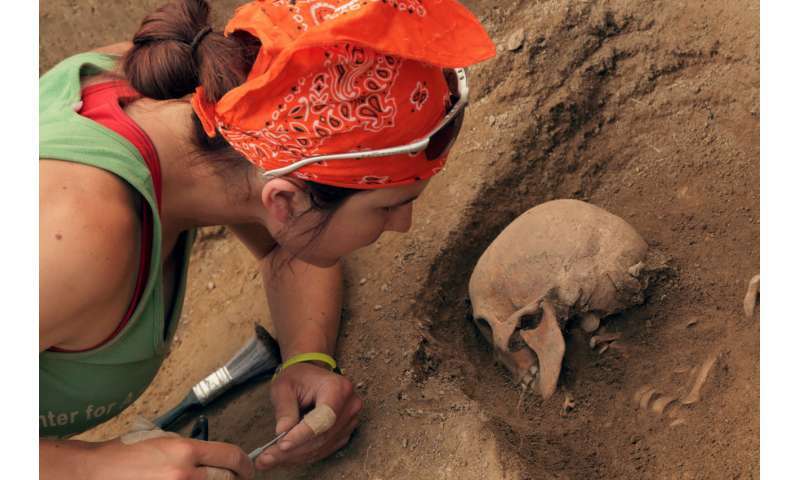 Washington University graduate student Elissa Bullion uncovers an ancient skull from a burial plot at the Medieval city of Tashbulak in Uzbekistan. Credit: Tom Malkowicz/ Washington University in St. Louis. Stable isotope analysis is the "gold standard" for tracing ancient diets. Makarewicz, a specialist in the technique, has applied it to understanding major evolutionary transitions from hunting and gathering to agriculture in the Near East. She is starting a new interdisciplinary ERC research project exploring the spread of herding across Eurasia. Other co-authors include Elissa Bullion, a doctoral student in anthropology at Washington University and two researchers from the Uzbek partnership: Farhod Maksudov and Samariddin Mustafokulov. Hermes, who has worked with Frachetti on archaeological digs across Central Asia for more than a decade, used these isotopic analysis techniques on human bones recovered from about a dozen nomadic and urban burial sites dating from the 2nd to 13th centuries A.D. The burial sites were associated with a wide range of communities, climates and geographic locations, including a recently discovered settlement high in the mountains of Uzbekistan, the Otrar Oasis in Kazakhstan and an urban complex on the lowland plains of Turkmenistan. While previous archaeological excavations at these sites have confirmed the ancient presence of domesticated crop plants and herd animals, their importance in urban diets was unknown. Isotopic analysis, however, shows how important these foods were over the long-term. "The advantage of studying human bones is that these tissues reflect multi-year dietary habits of an individual," Hermes said. "By measuring carbon isotope ratios, we can estimate the percentage of someone's diet that came from specific categories of plants, such as wheat and barley or millet. Millets have a very distinctive carbon isotope signature, and differing ratios of nitrogen isotopes tell us about whether someone ate a mostly plant-based diet or consumed foods from higher up on the food chain, such as meat and milk from sheep or goats." This study discovered interesting dietary differences between urban settlements along the Silk Road, but surprisingly little dietary diversity among individuals living within these communities. Perhaps driven by the limits of local environments, food production networks or cultural mandates, most people within each urban setting had similar diets. Diets of individual nomads within the same community were found to be much more diverse. These differences, perhaps a function of variable lifetime mobility patterns, the availability of wild or domesticated food options or personal preferences, suggest that nomadic groups were not as bound by cultural limitations that may have been imposed on urban dwellers, Hermes said. "Nomads and urbanites had different dietary niches, and this reflects a combination of environment and cultural choices that influenced diet across the Silk Roads," Hermes said. 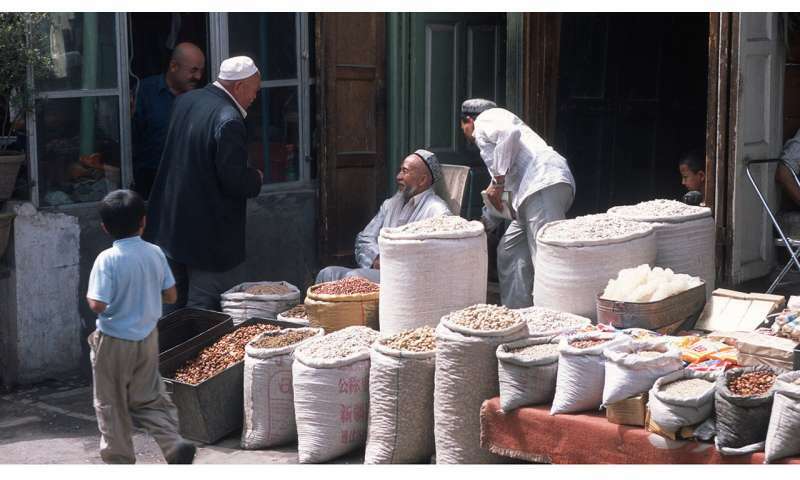 "While many historians may have assumed that interactions along the Silk Road would have led to the homogenization of culinary practices, our study shows that this was not the case, especially for urban dwellers." For now, Hermes, Frachetti, Makarewicz and their collaborators in Samarkand look forward to applying these isotopic techniques to new archaeological mysteries across Central Asia. "We hope our results lead to a paradigm shift in how historical phenomena can be examined through the very people who made these cultural systems possible," Hermes said. "The results here are exciting, and while not the final word by any means, pave a new way forward in applying scientific methods to the ancient world." "For close to 10 years our academic collaboration has yielded fascinating new discoveries in archaeology and has also fostered new international partnerships, such as the one spearheaded by Taylor Hermes, to carry out archaeological science at Kiel," Frachetti said. "This international approach is what enables us all—as a team—to maximize the scientific potential of our collaborative fieldwork and laboratory studies in Uzbekistan for the advancement of historical and environmental knowledge more globally." Did ancient irrigation technology travel Silk Road?